Boat and RV storage represents an additional revenue source in today’s self-storage industry. Larger spaces require bigger roll-up doors, and an innovative means of operation for today’s tenant. Roll Up Doors Direct proudly introduces the EZ-Access Roll-Up Door, providing your tenant with ease of operation, while allowing you extra units out of every building. Every EZ-Access Roll-Up Door from Roll Up Doors Direct includes a walk-through pedestrian door AND an easy to operate commercial sized roll-up door, All-In-One. Tenants gain access to RV’s and boats without lifting an over-sized commercial door from outside the unit. Provides additional security by keeping the larger roll-up door closed until the entire opening is needed to move a vehicle in or out of the unit. 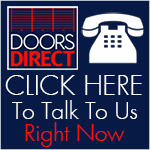 Roll Up Doors Direct are a trusted innovator in manufacturing of self-storage and commercial door products, fitting the unique aspects of any project. Provides quick access to storage unit during inclement weather or power outage. Open the main door from the inside. Standard reduced drive chain hoist on the roll-up door provides years of smooth trouble-free operation, while standing inside the unit. Release the dual-pin attachment on the full height swing door assembly, and the entire unit swings open revealing the larger clear opening required for many of today’s full-size vehicles. Boat, RV, and Commercial Vehicle storage is becoming a new denominator in the self-storage arena. What was once an ancillary income from parking in the back lot, is quickly becoming a primary line-item focus for almost every self-storage project. Many of today’s super-projects are providing customers with inside storage to store and protect these valuable oversized assets. While keeping these items out of the weather, out of sight, and out of harm’s way, their owners are also able to minimize depreciation by keeping the boat or RV in pristine condition for a longer period time. The problem is, how do you get these large vehicles into the smallest unit they will fit in, and not sacrifice driveway space that can be used for another income producing building? The EZ-Access Roll-Up Door is one solution catching on quickly in these new projects. The EZ-Access unit is two doors in one. First, it provides your customer with a 3’x7’ pedestrian swing door for ease of access into the unit; Second, the large roll-up door can be opened from inside the unit with a gear-reduced chain hoist or optional electric motor operator; and Last, the 3x7 swing door is hinged to the unit side wall providing a full width opening for moving in-or out the larger vehicle. As easy as 1-2-3, and the unit is fully accessible for even the largest vehicle. The EZ-Access Roll-Up Door is an all-in-one front entrance and roll-up door entry system, providing quick and easy access to any secured area without having to open the larger roll-up door first. In addition to the improved accessibility provided by the EZ-Access Door, this roll-up door product can provide an energy cost savings because of the smaller opening within the door system that helps to conserve the energy used for heating and cooling of the unit's interior space. You can enter and exit the unit without having to operate the larger roll-up door, saving both time and energy. The EZ-Access Roll-Up Door keeps construction costs down by providing for a single wall penetration per unit. This single opening includes the Roll-Up Door and the Pedestrian Door all-in-one. This innovative new door system also complies with local code requirements that may mandate two exits for a single unit, especially in the design of condominium warehousing. By providing access to the individual unit through a small pedestrian door, the larger roll-up door becomes easier to lift with the aid of a reduced-drive chain hoist mechanism, therefore minimizing the need for automatic door openers except as an option-only accessory. Electric Motor Operators are available to open the roll-up door, however, the folding of the swing door mechanism parallel with the unit wall must still be operated manually. In case of a power outage, both the chain hoist operated door and the optionally motor operated door can be accessed from inside the unit, allowing the renter to fully open both doors and retrieve their valuables at any time. In addition to being more customer friendly, the EZ-Access Roll-Up Door adds value to any self-storage property as well as a competitive advantage for the owner and operator. Now your renters can easily access their unit, maintain the highest level of security, and only open the entire unit when they need the extra opening width for removal of their vehicle or boat. The wider openings allow for minimal access driveway width, thus in many cases allowing for more rentable building space on the overall project. Available in industry colors to match most architectural schemes, the EZ-Access Roll-Up Doors are custom made to fit any opening size up to 17’ wide and 14’ high. Ask your Roll Up Doors Direct for information for your new or existing project.